Our Chick Chats allow us to connect with ladies centered around a foundation of Chickspiration. Being able to champion the next female is a vital component to creating a positive platform of engagement. This Chick Chat is unique because we got the opportunity to speak to a very special young lady who makes being creative look EXTRA COOL. By young, we mean 8 years old! 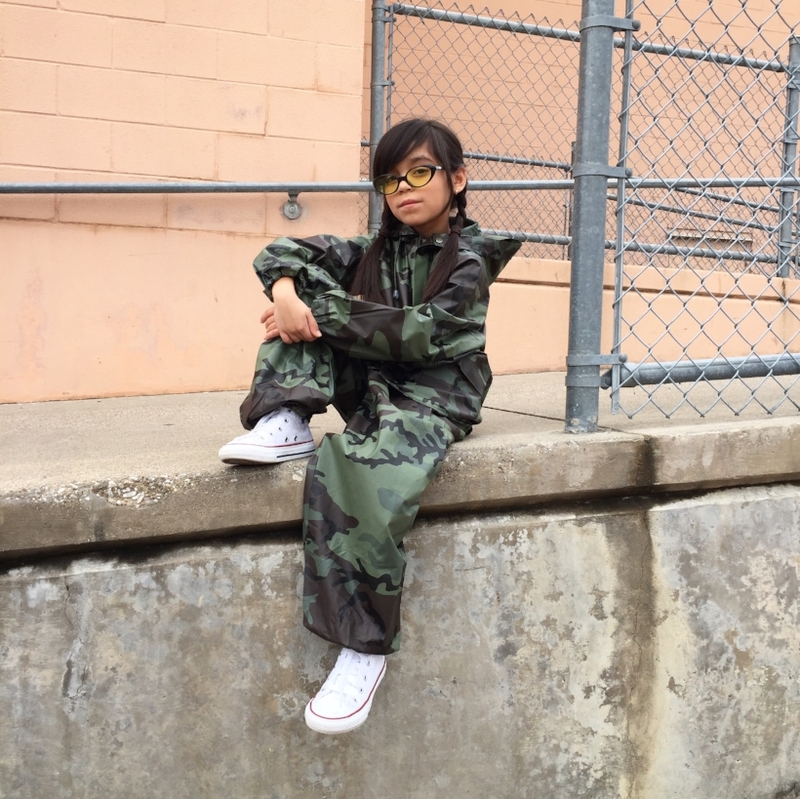 Not only is Giana (AKA Lil' G) full of excitement and overflowing with creativity, she is laying the framework for young girls within this new generation of youth. 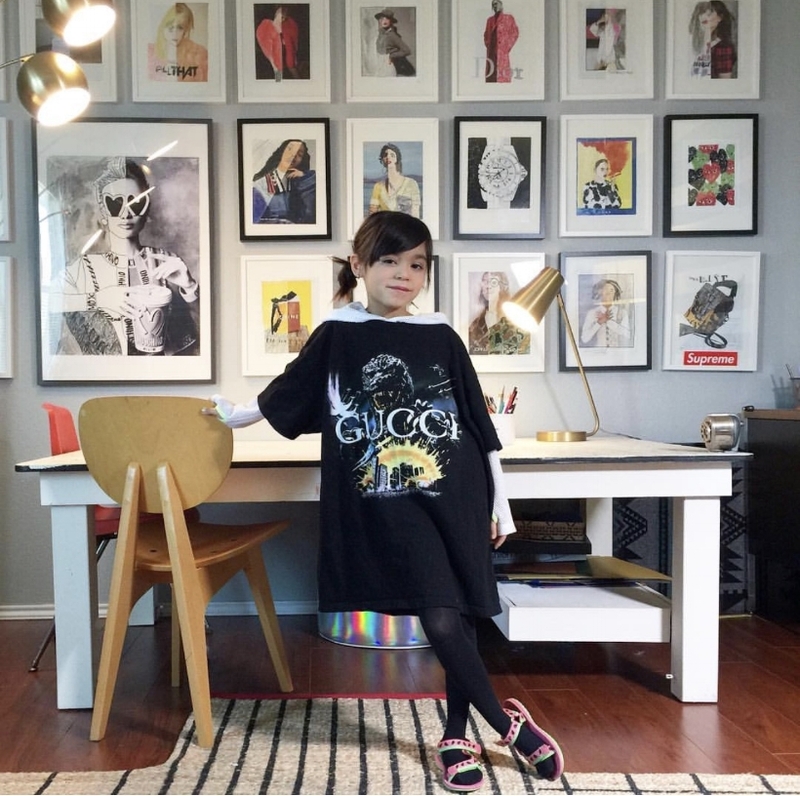 From having her own solo art show to collaborating on campaigns with big retailers like Old Navy, Giana is paving her own way with effortless style. Through her own words, she dishes on where her inspiration comes from, favorite artists/designers, and her amazing sneakHERstyle. I have been drawing since I was very very little. My mom and dad even have a video of me at 3 years old pretending to have an art show and showing them the things I made. They even have a picture of me at 2 years old sitting in my high chair painting a coloring page with watercolors! I have always loved to draw and create things and still have a love for it at 8 years old. My mom LOVES fashion and always wears sneakers. I guess I am influenced by her and how she puts together outfits and the shoes she wears. Hopefully, we will be the same size shoe one day so we can share sneakers! I definitely have a huge love for FASHION and everything COZY. Not only does it have to look cool, but also feel good when I am at school or running around doing what I do. My mama always has tons of magazines lying around and I like to look through them and see how people put their clothes together. My mama dresses pretty cool and I like her style. She inspires me a lot and we always have fun together when we shop. [Faves are...] Definitely the Vans x Peanuts collab. I have 3 pairs of shoes from that collaboration. I can’t pick one out of the three, so let's just go with that collab as one! Second, my Nike Cortez. I have the all white with the red swoosh. They go with everything and really make what you're wearing pop. Third, are my Puma x Tiny Cottons collab. These are so cool because they have polka dots all over them. It looks like art on a shoe. [During the Old Navy project] They had told me to bring my art and buttons that I had created. When the stylist for the back to school campaign met with me, she wanted to add my buttons to the camo jacket I was wearing. Little did I know that the jacket would be on every window for the campaign! It was such a shock to see my own art on display, The flagship store is located in San Francisco and my auntie took a pic of the huge window that had the jacket with the buttons. It was HUGE!!! AT THE CENTER OF MY HE[ART]. Having my first art show at 7 years old was a dream come true. I had tons of art that I showed in a gallery space. It was so cool to have people come up to me and talk to me about my art. I just wanted people to have fun and like what they see. It is something I will never forget. I love going to art shows and museums. When I visit these places, it inspires me to want to do art and keep creating. Also, when I have shows and I talk to people about my art, it also inspires me to keep having fun with it! My all-time favorite artist is KAWS and my favorite designer is MOSCHINO. I love how they both have fun with what they create and design. STREETWEAR COLLABS WITH HAUS OF JR. The owner of the company had attended my LA art show and was very impressed with my work. She exchanged info with my mama and the very next day they spoke about possibly collaborating on a range of limited edition shirts. From there, it all began to happen and I was drawing designs! My favorite shirt I drew was the DIOR with Ruth Bell. The hat was so much fun to draw. All the designs I made sold out in one day and I was very happy. I would say you don’t have to wait until you're a grown up to follow your dreams [or do cool things]!! My mama and daddy always tell me I can do anything if I work hard. Chickspiration means... Girls can do anything!!! FROM THE DESK OF MOMMA G.
Giana does Karate twice a week and has been doing it for 2 years. 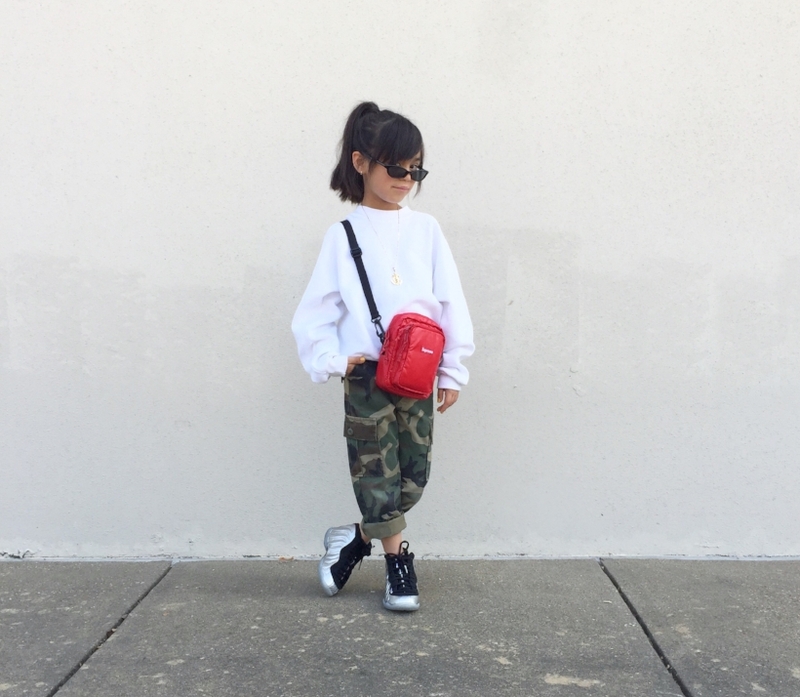 She also enjoys reading, playing Barbies (or actually styling her Barbies), playing LEGO with her younger sister and brother, going to the bookstore or library, and just being an adventurous kid. She is really very caring and smart and has a straight-A grade average. Her love for science is major and also dreams of someday even becoming a scientist. NO 2018 SPOILERS, JUST FAITH. I feel like we take things day by day and just try to live in the moment as much as possible. Everything has happened so organically with Giana’s art journey and that's what has made this adventure so amazing. I want Giana to enjoy being a kid and whatever is in God’s plan will happen for sure. She has accomplished so much in 2017 and I can only imagine that 2018 will be just as fun and full of surprises. We just can't get enough of Lil' G and even thought she may be small, her personality is big and beautiful. Check out more of Giana via the social media streets, listed below. See more street style and art on Lil' G's Instagram, Facebook, Youtube, and DEARGIANA website!